I googled “boatload of sweet potatoes”. Surprisingly, several food writers own that very phrase. Happy that others had encountered this excess before, I settled on the writings of a Seuss Chef (sorry!) for a dish of Green Eggs and Yam. The colors looked lovely and while the dish wouldn’t make a dent in my sweet potato stash, it was worth a try. Plus, I had let everyone fend for themselves yesterday morning and I wanted to do something special. On this lazy Sunday, I engaged my middle son in the preparation. It began well, shredding sweet potato and sweet onion, throwing in some flour, a beaten egg and a few spices. I laid out the griddle to warm it up and coated it with sunflower oil. Sunflower is a healthy oil that works well at high heat. The griddle got very warm very fast and these cakes stuck like snails on lettuce. Second batch, I tried cooking spray – same result. I’d made these patties too large and they were burning before cooking through. I ended up scraping it all onto a platter and flattening it out with a spatula. If I’d paid closer attention to the instruction, I might have discovered that I’d set the heat too high earlier. On to poached eggs. I grew up using a poacher and that really is easier but instead, I boiled the water, added vinegar and swirled it with a spoon before dropping in the egg. This worked well. Now for the assembly of the dish and the more difficult task of assembling my family around the breakfast table – done. The sweet potato cakes, much like latkes were lovely. Despite being so difficult to lift while cooking, they reshaped nicely and the combination of sweet onion and paprika gave them a smoky distinction. I can see these on their own with a bit of sour cream or perhaps as a side dish for beef. It plated up well and was 100% local. Perhaps, it was the combination of egg with sweet potato and pesto that caused the issue. “Oh,” my middle son exclaimed trying to remain polite while looking for his exit. My oldest wasn’t nearly so cautious. To be fair the recipe creator did indicate that perhaps this would be better suited with creamed spinach than pesto and I have to agree. What irks me is that if I’d have really thought about it, I’d have known this before I made such a mess of the kitchen. Any place else in your life that you need to heed the lesson at hand? Heat oil (about ½ cup, or enough to cover the bottom of the pan) in a large skillet on high until hot, but not smoking. Reduce the heat to medium/high and drop sweet potato mixture into the pan by ¼ cups (about 3 pancakes per pan; don’t overcrowd). Flatten each pancake slightly with a spatula and fry until browned and crisp on the bottom, about 2 to 3 minutes. Turn pancakes and repeat. If the pancakes start to brown too quickly, turn down the heat to medium. Remove from pan to a paper towel lined plate. Keep warm in warming drawer or oven at 200 degrees. Sweet potatoes are one of the wonder foods and I make patties often. Your dish did come out very pretty. The sweet potato part sounds delicious. I look forward to trying! I recently dined at a restaurant and had catfish sauteed in a sweet potato-pecan coating. It looked much like the shredded sweet potatoes in your pic. The “breading” (so to speak) seemed to be nothing more than sweet potato, a few spices, and pecan chips. (I’m not a poached egg person, so I’d have to go with the creamed spinach). The sweet potato part was really good and what an interesting idea for “breading”. 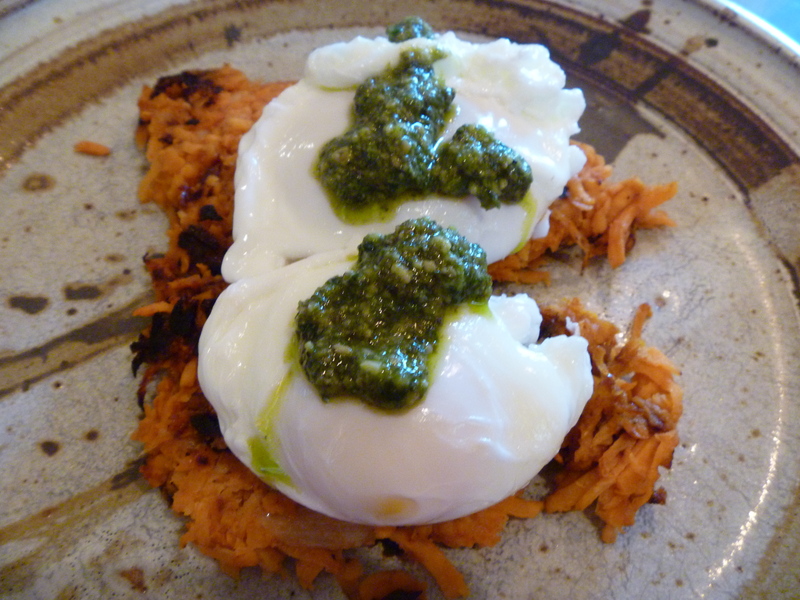 the sweet potato part was good – eggs are good – pesto is good. I just had a tough time with the combination. In keeping with the recipe, and having it stick less, I would probably hold the sea salt back from the ingredients…using it in the pan instead… It works on griddles, and is why egg flipping pans, ( Stainless Saute Pans) are never cleaned wet, ( during a shift anyway) but, rather rubbed, and buffed with salt…dry. In the potato pancake case, you could rub the dry pan before it was hot, with salt…heat the pan, and then add the oil…or, just use the layer of salt the recipe calls for under the pancakes. I have used salt to keep Hamburgers from sticking to a flat grill, as well as pans. Just a thought, about salt!!! Interesting Paul. I have no formal training so help is always welcome. I didn’t think of salt as a culprit and you’re right about using a pan instead of a griddle. I did come away with that learning. I love the experimental aspect of cooking, and learning to follow my intuition in the kitchen. I’m eager to try this one, although sweet potatoes are not common farm fare around here, being a long-season crop. If I do, I’ll probably top with some braised green, like Swiss chard. Thanks for sharing the positives and negatives with us….that’s what it’s all about. Cooking is not about perfection! When trying something new, I find that when problems arise, or disasters, I end up doing a better job the second time around. For some reason, when we struggle through a task, we learn so much more! I absolutely love sweet potatoes, so this dish is one I’ll have to try. I also appreciate the recommendation to dry rub a pan with salt. How about everywhere else in my life? I tend to be a jumper rather than a planner. Sometimes it works. Sometimes it works like pesto on eggs. Thanks for the recipe. I’m an orange vegetable phobe, but found that I actually like the dreaded sweet potato made into latkes. Will try yours! These look very nice indeed, Tammy, and it just so happens I have some sweet potatoes which need using up. Thanks for the recipe! Eleanor – it is about experimentation, isn’t it? and yes, I’m with you on the braised greens. Lisa – I have a lot if you need any. Today, I’m going to try a raw sweet potato soup. Jane – I only know that yours will be picture perfect! Nancy – I love all three flavors but not together. Kate – if you do them right, I think your young troops will enjoy them. Dawn – if you go the full monty, I want to hear about it. Debbie – I’d be surprised if she didn’t like them. Daisy – in a box, with a fox? Kathy – Hope yours turn out better than mine! love sushi so yeah, maybe! Hahaha! I can think of so many incidents where I felt exactly like you. Slow cooking always has its rewards although these look delicious and crispy. It’s Sunday over here and I’m thinking why not try these…I’ll give my honey loops regime a break. You may really like them. I can see basil pesto being weird with sweet potatoes. Sage pesto, though, would be marvelous! Now that’s an idea. I haven’t had sage pesto before. I’m just coming around to eggs as an adult and so far, I seem to like poached eggs best–must learn how to make them myself. Your sweet potato pancakes certainly sounds delicious as well! oh, I love them poached. It is by far, my favorite. It looks better than it tasted. Camille had a great suggestion about trying sage pesto. I think I will next time. AH, now I understand your comment on my Potato Pancake post! I haven’t tried making sweet potato pancakes—I wonder if their natural sugar content made them so sticky. Still, it’s a dish worth pursuing, and perfecting. Braised greens–chard, kale, or spinach, might have better suited. Experimentation–it’s how we learn! Yes, braised greens would be better or the sage pesto that Camille suggested. Charming, as always. Thanks tammy. I adore sweet potatoes and love the idea, as does my sister, of using spinach as a side with cardamon in fat free ricotta? hmm don’t know about the cardamon but maybe! These sound wonderful! My sisters and I are getting together this weekend and this will be a real treat for breakfast. Thanks Tammy. Well, good luck with it. Watch the heat and adjust the flavors as you go! I could do with a plate of this right now! Well, if you try it, let me know. You can write about your life, about the agriculture and your culture. The readers will be happy to meet another world. I’m happy to give it a shot. I like sweet potato fries a lot, even though I’m not a fan of the horrible baked Thanksgiving monstrosities most people think of when they hear the words “sweet potatoes”. Your savory breakfast preparation sounds like it will be more in the fries category so I my have to give it a try. Thank you! It is not one of those marshmallow topped varieties. google really does have all of life’s answers, huh?! This is so fun and creative! I would love to have access to their analytics to see what some of the more common questions are! It really was a very good looking breakfast. OK, that just made me laugh because people find my blog the funniest ways! “I ate too much spaghetti carbonara” was my favorite. Anyway, great recipe! Sweet potatoes are a favorite in our house. I know! The search terms crack me up. My latest is “triple chin” which is a term that I used once on one post.